If you follow me on Twitter, you may have seen me tweet a couple weeks ago asking for natural product recommendations at Sephora. It's not somewhere I've shopped for quite a while now, but I still get their emails and they had a Bare Minerals eye shadow gift with purchase that had me just about ready to pull out my wallet. In the end I decided against buying anything - it's not as though I needed the eye shadow anyways - but that darn GWP almost had me! 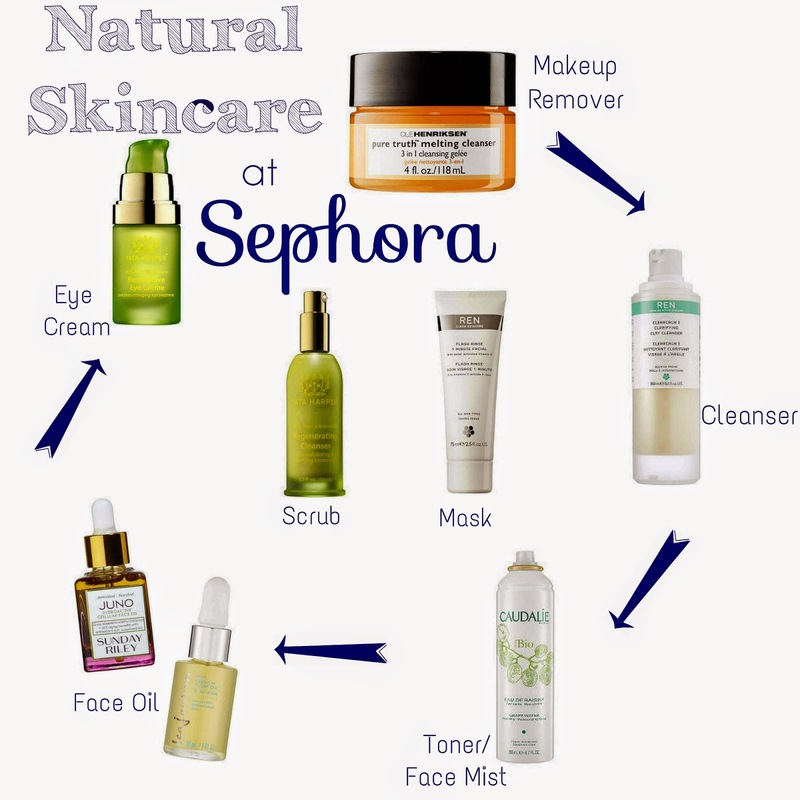 I know for a lot of people Sephora is an easy place to shop, so after my thorough browsing experience, I thought I'd challenge myself to see if it would be possible to create a completely non-toxic skincare routine using only products sold at Sephora. Here's what I came up with! Keep in mind that I haven't actually tried most of these, so I can only speak to their ingredients, not their efficacy. Everything is free of the regular nasties like parabens, phthalates, silicones, petroleum, PEGs, and dyes, and is also free of phenoxyethanol - which presented quite a challenge, let me tell you! So, is it possible to create a full non-toxic, natural skincare routine at Sephora? Yes. Is it easy? No. And it's also pretty costly. These eight items came to a whopping $497! I think you could do a lot better for your money shopping somewhere else, but in a pinch, Sephora could have you covered. Which is always good to know. What do you think of Sephora? And - since I'm always up for some window shopping - let me know if you'd be interested in seeing something similar for makeup. I love Sephora and how available all natural, good for the skin products are nowadays!! I love Tata Harper! I am also guilty of creating "imaginary skincare routine" as well. Here's me crossing my fingers that green beauty will become more convenient and affordable. I think Tata is probably the best natural line at Sephora :) Things are certainly moving towards more affordable and available green beauty products for sure, but I'm with you - it can't happen soon enough! I used to love Sephora, but since I've been trying to used more natural and non-toxic products, I find it really hard to shop there. I wish there was a store like Sephora with all natural stuff! So true! The worst part of Sephora for me is how uninformed the staff are about natural products. I'm sure they mean well, but I get so frustrated when they insist brands like Fresh and Boscia are 100% natural. Greenwashing at its best (or worst) and I hate to think how many people buy into it! Yup that's exactly the reason why I don't shop at sephora anymore. They don't carry the more afforable green beauty brands. Which is a real pity. Yup! Although they don't really carry affordable anything, do they? Mainly high end, even for non-green products, so I guess it's not altogether surprising. I couldn't even get into factoring in that not everything is stocked at every Sephora! Here, they're constantly phasing things out/changing what's in stores, which is frustrating. The only thing that puts me off BITE is that they use dyes and there's no way to know if they're just in some shades or in everything. Their stuff always looks so pretty though!